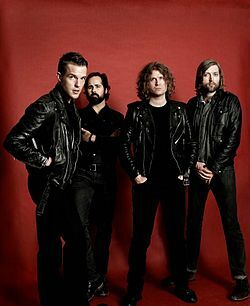 The Killers are an American rock band formed in Las Vegas, Nevada in 2001, by Brandon Flowers (lead vocals, keyboards) and Dave Keuning (guitar, backing vocals). Mark Stoermer (bass, backing vocals) and Ronnie Vannucci Jr. (drums, percussion) would complete the current line-up of the band in 2002. The name The Killers is derived from a logo on the bass drum of a fictitious band, portrayed in the music video for the New Order song “Crystal”. The group has released four studio albums, Hot Fuss (2004), Sam’s Town (2006), Day & Age (2008) and Battle Born (2012). They have also released one compilation album, Sawdust (2007) and one live album titled Live from the Royal Albert Hall (2009). To date, the band has sold over 6 million albums in the United States, over 5 million albums in the United Kingdom, and a total of 20 million worldwide.